The usual way to do the US West Coast is to drive Route 101 – which is fine, if a bit obvious, perhaps a touch unadventurous. There is another way which is neither obvious nor bland, but a great adventure. 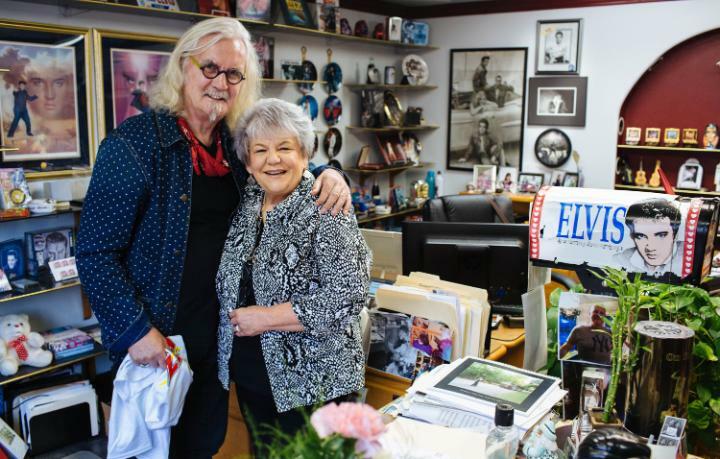 And – as Billy Connolly reveals in his current television series – it is brilliant. It is the train. But a word of caution straightaway: don’t even think about it if you are in a hurry. No one in America takes the train if they need to get somewhere fast. They fly between their cheerless airports, and then they drive. The train is for those with time on their hands, the lucky ones. We went south, Seattle to Los Angeles, which is 1,377 miles according to the schedule published by Amtrak, the National Railroad Passengers Corporation. We did it in stages, taking the best part of a month in all, stopping to hire a car to explore east or west, then picking up the train again. We had the time, you see, and it was wonderful. Our first leg was Seattle to Portland, on the sleek and handsome Cascades which runs between Vancouver in British Columbia and Eugene, Oregon. The procedure for getting on an Amtrak train is magnificently, absurdly laborious. You book a ticket in advance or buy one at the station, but there is no reservation. You must check in first, just like at an airport, and wait for the train to pull in. You are directed to the carriage with the empty seats, where the attendant – one for each carriage – ticks your name off on a list and gives you your seat number. It takes time, lots of time, and staff, lots of staff. It was worth it inside: soft, well-padded reclining front-facing seats, ample leg room (crucial for a lanky fellow like me), big windows to watch the world go by. The speed was – well, let’s say stately. The 187 miles to Portland took five hours, which was about average for the whole trip. For a time we had the wide blue waters of Puget Sound to the right and distant mountains to the left. Then there were rivers and lakes, one-horse towns and two-horse towns and real towns like Tacoma and Centralia, which the Americans confusingly call cities. We thundered over the Columbia River into Portland, which really is a city and a great place for beer – it’s a kind of religion there – roses, books (the amazing Powells on West Burnside has a million of them), and good pub grub. A few days later we were back at its very imposing Union Station for the next leg. We had to wait a while - timings are generally on the theoretical side – but it did not disappoint. A great silver monster – Amtrak’s Coast Starlight – pulled up in a mighty crescendo and climax of roaring locomotive power, clanking wheels and hissing brakes. With 12 two-storey coaches and two engines, it filled the station with its presence and noise. Checked off by our uniformed attendant we mounted the stairs and sank into our seats. At length, half an hour late, we heaved our way out of Portland and over the Williamette River. 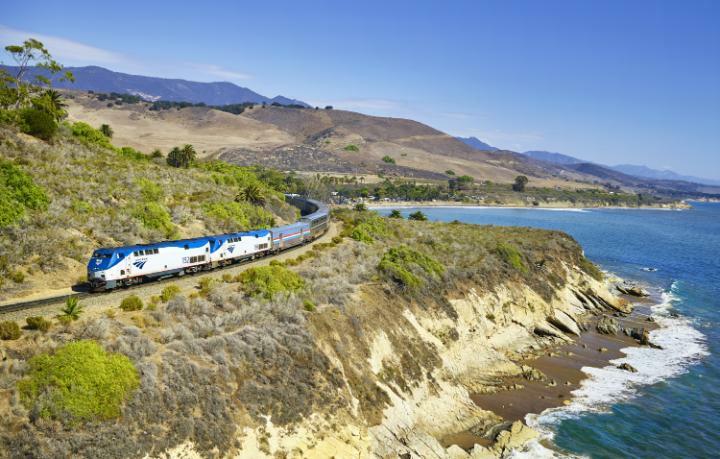 The voice of Duncan, our chief conductor, informed us that, because of extreme heat – it was around 35 Celsius outside – the Coast Starlight would be observing a speed limit of 50 mph until nightfall. Duncan was a champion: avuncular, courteous, immensely authoritative. He had a way with words: “If you are caught smoking the next station will be your station. We don’t want that to happen.” He told us gently that if we wanted to talk at length on our phones we had to go downstairs. The way he dealt with a waspish, shrewish Chinese woman who was snapping into her mobile at insistent volume was a master piece in the art of command. We followed the valley of the Williamette through Salem and Albany to Eugene, past vast, sun-baked fields of maize and pumpkins over which giant sprinklers threw the precious water in great sparkling arcs; beside dead straight freeways on which the cars moved faster than us, but not much, as the Americans are generally conscientious observers of their very restrictive speed limits. After Eugene the great train began to climb in the Cascade Mountains, going slower and slower, creaking and gasping its way around the bends. The track was closed in by forest, which opened suddenly to reveal amazing views of distant tree-cloaked ridges and peaks. The track in the US is controlled by the freight companies, and the freight trains claim a lordly precedence over the passenger trains. Every so often we ground to a standstill to allow one of these monstrous snakes of waggons to pass by with infinite slowness. The sun behind us and dusk gave way swiftly to darkness. We were almost two hours late into Chimult and Klamath Falls, and although we made up some time thereafter, it was 3.20am when we staggered out at Redding, California – an hour behind schedule, and a challenging time to be collapsing in a motel room. But that is part of the adventure. From Redding we took a car out to the Lost Coast and the giant redwoods of Humboldt State Park and other attractions, before returning to the station for the 2.21 am departure to Emeryville. It’s Redding’s only train of the day, so – unsurprisingly – the station has a somewhat neglected air about it. This time the Coast Starlight – a different one, but just as splendid - was on time. Probably because of the ungodly hour, my recollections of this stage of the journey are somewhat hazy. I do, however, remember not getting any proper breakfast, always a sad business. Emeryville (the home of Pixar Films, in case you are interested) is the stop for San Francisco. Hereabouts we missed out around 250 miles of train track by using a car for Yosemite, Monterey, the Big Sur and San Simeon; and it was not until San Luis Obispo that we were reunited with the silver beast, alas with no Duncan. This last section to Los Angeles is mind-boggling. While Route 101 heads inland south of Guadalupe, the railway hugs the coastline. On one side vast beds of kelp pulsed with the rhythm of the empty blue sea, and the surf pounded one empty beach after another. On the other stretched parched, biscuit-coloured hills, broken by the strange, silent installations of the Vandenberg Airforce Base, the missile and satellite launch site. At length the first oil platforms appeared on the horizon, heralding Santa Barbara, Oxnard and the approach to LA. And that was some finish: rolling into the cathedral-like spaces of Union Station, then dragging our bags across the terracotta and marble-inlay floor of the waiting room, under glittering chandeliers and the dark panelled ceiling (concrete dressed up to look like mahogany), past the rows of padded seats, the whole place a magnificent monument to the great days of American rail travel, and the high ambitions that went with them. I think we all had that mixed feeling of regret and gratitude that come with the ending of every adventure. Writing about it now brings it all back: cups of tea, cold beers, gins-and-tonic from the café, jaw-dropping views from the observation lounge, comfort and space, the delight of being able to peer into people’s backyards and through their living room windows. I long to do it again. Remember the old (British Rail) advertising slogan: Let The Train Take The Strain. Wise words. Amtrak’s most northerly transcontinental service between Chicago and Seattle crosses the farmland of Wisconsin before joining the Mississippi for 40 miles and cuts across the prairies of North Dakota and the grasslands of Montana, ending with the Rocky Mountains. 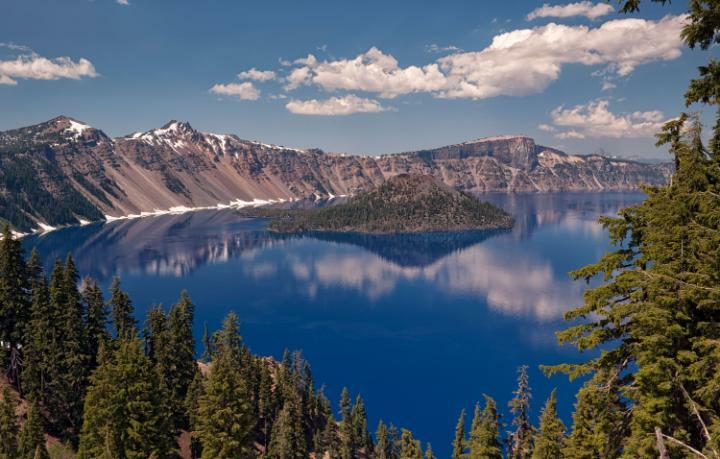 A spectacular coastal journey between Seattle and Los Angeles with detours inland through the Cascade Mountains. At 2,438 miles (3,900km), Amtrak’s longest route links Chicago and Emeryville (for San Francisco), cutting across the centre of the US via cattle country and the Great Plains. The train follows the Colorado River for more than 200 miles. 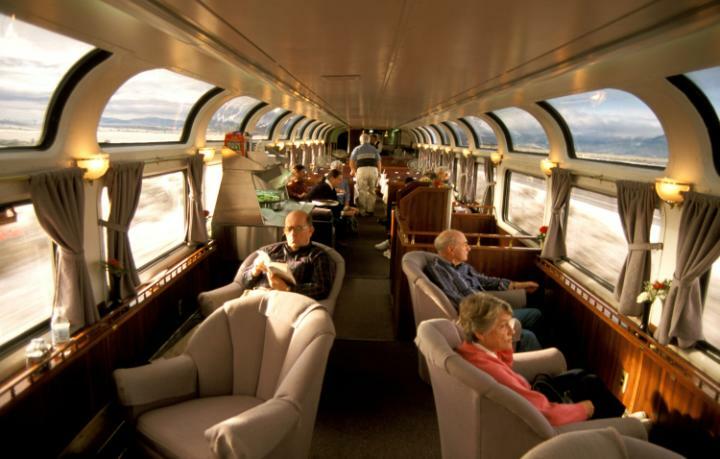 These journeys in Canada through the Rockies and south to Seattle are among the most popular tourist train routes in the world. 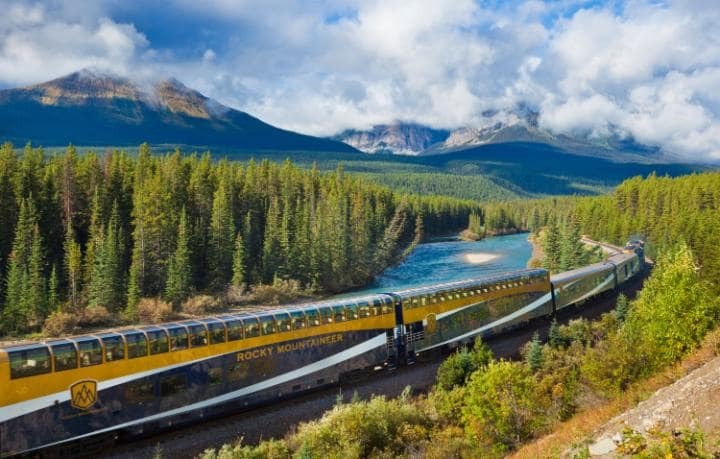 This epic journey in refurbished silver Fifties carriages run by VIA Rail Canada is the perfect introduction to the country’s vast landscapes. Amtrak (0800 033 7810; amtraktraintickets.co.uk); Rocky Mountaineer (0800 088 5541; rockymountaineer.com); VIA (0845 644 3553;viarail.com); Great Rail Journeys (01904 734500; greatrail.com); Railbookers (020 3327 2467; railbookers.com); Ffestiniog Travel (01766 772030; ffestiniog travel.co.uk). The Amtrak website is easy to use and offers a full map of the 500 stations covered across the United States. Non-stop the 35-hour Seattle-Los Angeles journey costs as little as $115 for an adult, (Adult is 13-61; Senior 62+); a more flexible/fully refundable ticket costs $150. 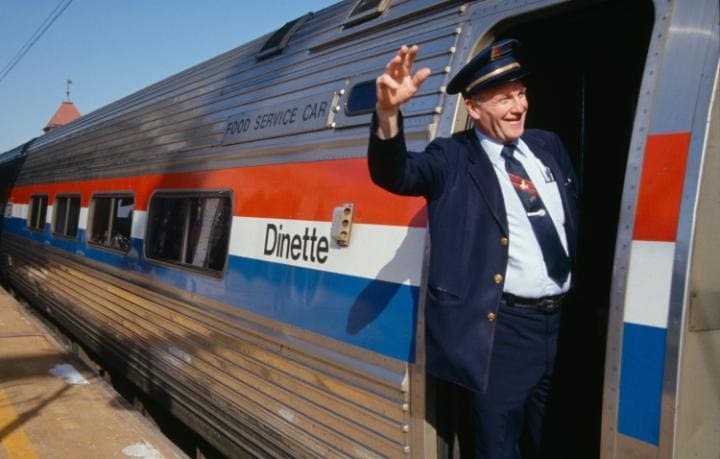 A sleeper or “roomette” costs about $350 for two people – with meals included. There are additional charges if you want to break the journey as as the Forts did – they paid a total of $820 for three adults and one senior. 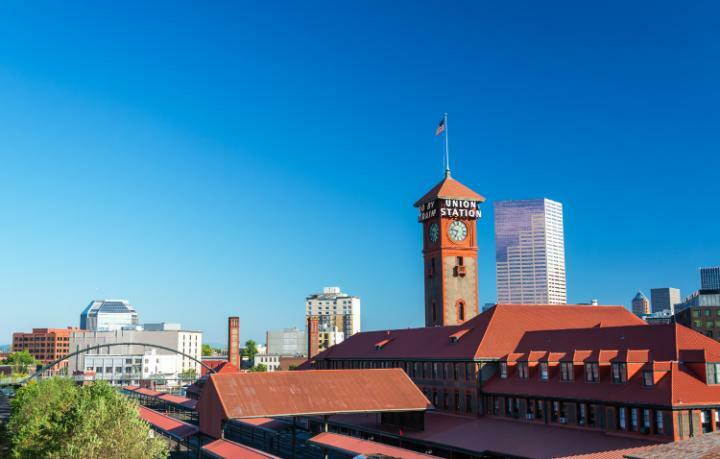 (Seattle – Portland $130; Portland – Redding $290; Redding – San Francisco $250; San Luis Obispo – LA $150). Amtrak also does a number of package deals: you can do a 10-day journey from Chicago to the Grand Canyon with a couple of stops/mini excursions along the way or an eight-day trip between San Francisco and Seattle. 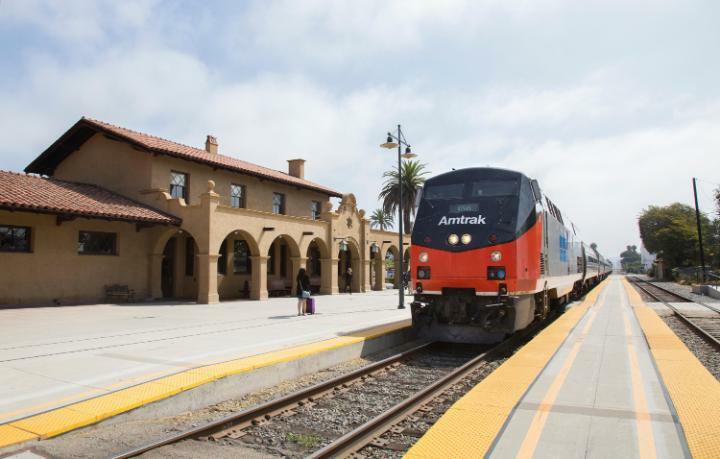 The California Rail Pass allowing for up to seven days travel over a 21-day period costs $159 for adults and $79.50 for children 2-12. Seats are wide, comfortable and almost fully reclining. The Coast Starlight has an observation lounge with swivelling seats that provide a fantastic view of the scenery. There is also a café, a lounge for business class passengers (complete with a wine-tasting event) a dining car and an at-seat dinner service. Advance booking for the dining car is advisable. Wi-fi is available on some trains. Passengers can take two large bags for free and you can pay to bring on two extra. Many of the larger stations offer an airline-style checked baggage service – convenient if you want leave your cases while you do some last minute sightseeing before boarding a train. Amtrak has teamed up with the National Park Service to provide a Trails and Rails programme which gives passengers information about the cultural and natural heritage of the areas they pass through. 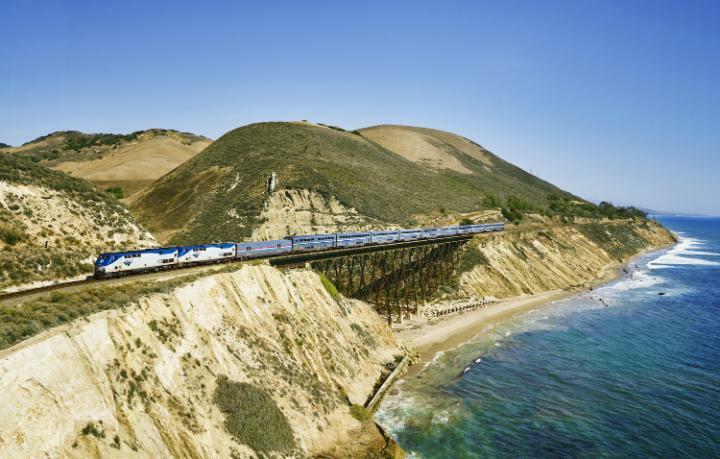 The Coast Starlight has two Trails and Rails programme sectors – between Seattle and Portland and between San Luis Obispo and Santa Barbara.